I'm about to start a new and exciting project. It's a new shawl pattern that I'm test-knitting for Sivia Harding called the "Sister Joan Shawl". I'm waiting for the arrival of my new weigh scale so that I can divide the skein in half. One of the questions that Sivia needed an answer to was how many repeats can be done when the halfway point is reached. I'll be using Tosh Sock yarn is a gorgeous burgundy color called "tart" and Miyuki garnet gold luster beads, size 6/0. I like the tone-on-tone matching of the yarn and beads. I've tested patterns for Sivia before and I've always found her designs to be pretty and the pattern well-written. 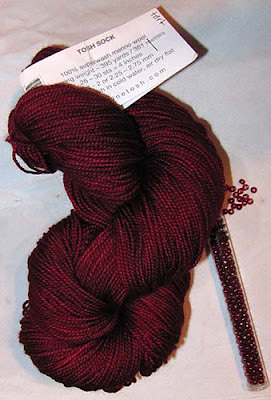 I'm looking forward to seeing how this shawl turns out as I haven't seen a picture of it. Lovely! I'm using those exact beads right now on something... the gold luster is compelling, it makes them so rich looking.